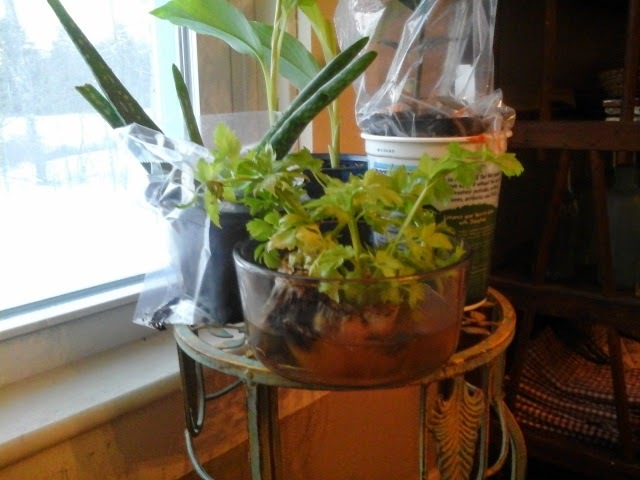 Along with yesterday's post about growing livestock and pet food, one of my goals for the homestead is to be able to grow certain medicinal plants and herbs. 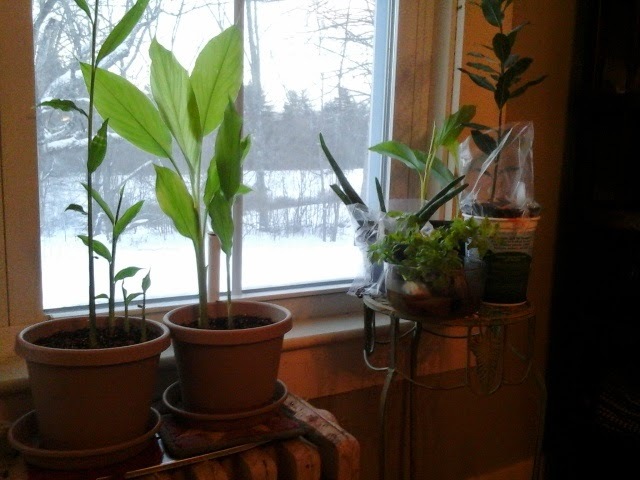 So, its winter, and obviously we can2t plant outside, but i can start some things indoors for planting later. The plants pictured here all have strong medicinal or culinary uses. I am not a doctor or herbalist, and this isnt medical advise. My opinion of these plants is based on a long tradition as well as scientific research. Ginger is very easy to grow. Just take one of the fresh ginger roots in the produce section of the grocery store, and plant it in damp soil. Ginger is a powerful plant...helps with the immune system, digestion, nausea, amd other ailments. It likes warm humid conditions, and thats why they are sitting on the radiator. Tumeric is also an extremely valuable medicinal plant. You usually see it ground into a powder in the spice section of the market. It is a common seasoning in certain eastern dishes. It is also found in regular ol'mustard. Tumeric is a pain reliever and anti inflammatory, and has been associated with improvement in dementia amd Alzeimer's symptoms. I have known of a runner who was going to drop out of a 100 mile race due to some knee pain. He tried some tumeric at the aid station, and it did such a good job that he was able to finish the race. Bay leaves are a seasoning and add a wonderful flavor to things like chicken soup, or roast meats. Aloe vera has many uses. It is especially useful for skin issues, burns, cuts, and rashes. It is also taken internally for a variety of complaints. You are all probably familiar with using Aloe Vera for all those things. the celery plant is just something i am rooting to plant in a pot indoors. I will be able to snip stems off these once they grow..
And then there is the elderberry bush. Elderberry is a perennial shrub, native to Europe and the US, which bears clusters of tiny, dark purple berries. Elderberry can be made into jam or pies, but it is a powerful immune booster, and traditionally made into a syrup as a tonic to battle infections, colds, flus, etc. You can actually purchase elderberry syrup in the drug store under the name Sambucol. 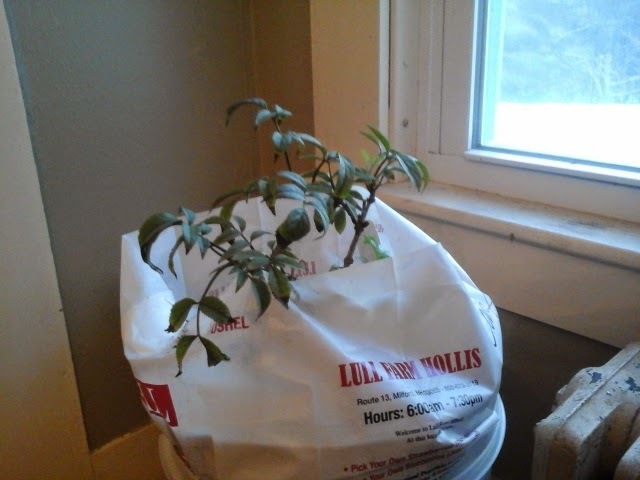 I want to have several of these shrubs, but i bought this one as a start, and will plant it outdoors in the spring. There are a couple of annual plants that fall into this category of having good medicinal qualities. I guess you could say that real food (not the processed refined crap that passes for food) is all medicine, but some individual plants definitely have uses. One of these is cayenne pepper, which can dramatically stop bleeding when the ground up dried pepper is packed into a wound. I have used this myself, and I wont be without cayenne in my arsenal of helpful plants. Garlic is an immune booster and anti-viral. I planted the garlic already. They will over winter under a thick layer of mulch in the garden. Weather today. I forgot to look, but it was probably single digits. Basically, cold. Snowed again today. wildlife- saw the turkeys again, and the usual birds at the feeder. Daily exercise- I spent about two hours shoveling snow. This seemed sufficient to stand in for my upper body and core work.